LOS ANGELES – A Justice Department attorney said in opening statements of a federal grand jury trial Tuesday that a former Los Angeles County sheriff’s deputy intentionally covered for his fellow officers when he lied to federal investigators about a 2011 beating in LA’s central jail. Byron Dredd was assigned to the visiting area of the LA’s Men’s Central Jail and was on duty when LA resident Gabriel Carrillo entered the facility on Feb. 26, 2011 to visit his brother who was detained there. After he was handcuffed for violating the jail’s cell phone policy, Carrillo was slammed face-down on the ground of a deputy break room and beaten badly by a group of officers. Paramedics transported Carrillo to the hospital where he was treated for cuts, bruises and chemical burns from officers’ pepper-spray. The incident was the subject of a high-profile investigation and federal lawsuit that resulted in a $1.2 million settlement in 2014. The deputies involved in the beating and the orchestrated cover-up of the incident were sentenced to time in federal prison. Dredd, who wrote in his incident report that he saw brief moments of the beating through a small, grated window in the break room, was the sixth deputy indicted by a federal grand jury. An October 2015 three-count indictment said Dredd, a deputy from May 2009 until he was discharged in June 2013, lied to FBI agents when he was interviewed about his report, which corroborated the story that deputies put forth. A jury acquitted Dredd in 2016 of charges that he falsified reports as part of the cover up but was split on whether he was guilty of lying to federal investigators. Dredd’s effort to dismiss the remaining charge was denied by U.S. District Judge George King. On appeal, the Ninth Circuit later affirmed King’s ruling and cleared the way for this week’s trial before U.S District Judge Dale Fischer. Defense attorney Nina Marino of Kaplan Marino said in her opening statement that at the time of the beating, Dredd was an inexperienced deputy who based his report, which he had little time to write, on the viewpoints of his fellow officers. “His report was wrong,” Marino said, adding that Dredd was unaware that deputies were developing a cover-up. Dredd, Marino added, was largely distracted during the beating anyway since he was in a separate part of the jail visiting area, focused on his duties. But Justice Department attorney Agustin Dorian Orozco said Dredd joined in on the deputies’ collective effort to concoct a cover-up of the beating. “The defendant intentionally covered up the actions of his partners and he lied about what happened to the FBI,” Orozco said. Dredd lied in his report when he said Carrillo, while being beaten, swung his arm in attempt to punch a deputy and eventually escape from the room, the indictment said. “[Carrillo] never tried to escape,” Orozco said. On the witness stand Tuesday, Carrillo, wearing a baggy white shirt with slicked back hair, said that an otherwise routine visit to see his brother turned violent after he and his girlfriend were pulled into the break room. Officers were upset that the couple had cell phones in the lobby of the visiting area, which the jail prohibits. In the break room, Carrillo said deputies handcuffed him and pushed him face-first into a refrigerator. One deputy stayed behind to ask the couple about the cell phones. “If I wasn’t in handcuffs, things would be different,” Carrillo said he told his girlfriend, adding that he also asked her not to respond to questioning. Carrillo told Justice Department attorney Veronica Dragalin that the deputy, who took his words as a threat, called for support. “The deputy said, ‘Homeboy said that if he wasn’t in handcuffs he would take flight on us,’” Carrillo said, adding that the expression means he would fight the deputies if he weren’t in handcuffs. The break room filled with officers who threw Carrillo face-first into the ground and began pummeling him while his hands were handcuffed behind him. He was also pepper-sprayed while on the floor. 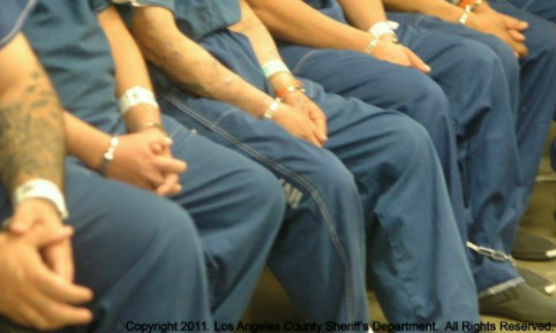 As a result of the federal investigation into the beating, 15 members of the Los Angeles County Sheriff’s Department were convicted for federal civil rights offenses. The deputies involved in the Carrillo beating – Pantamitr Zunggeemoge, Fernando Luviano, Sussie Ayala, Noel Womack and Eric Gonzalez – were later sentenced to federal prison.